It's amazing what kids can do with their tablets these days! 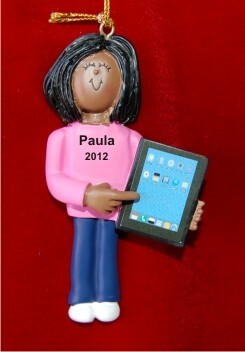 Celebrate a fast-paced tech age with the African American female with tablet personalized Christmas ornament featuring her name and the year. Our hand lettering artists can add a custom message on the back of these kids ornaments personalized for added pleasure at your option. The female girl with tablet personalized Christmas ornament is a fun gift for the tree, though she might prefer to display it in her locker or on her book bag when received in our classic velvet drawstring pouch.